The electronic music production at the studio of Philips Research Laboratories (1956–1960) and the teaching programmes at the studios of Delft University of Technology (1957–1960) and CEM in Bilthoven were integrated in 1964, when Gottfried Michael Koenig (*1926) assumed the post of artistic director of the Studio for Electronic Music (STEM) at Utrecht University. Koenig then added an important third element: research. On the basis of this trinity, in three years STEM evolved into the Institute of Sonology, which was housed in Utrecht until 1986 and then moved to the Royal Conservatoire in The Hague. Koenig’s integration of education, production and research still constitutes the Institute of Sonology’s DNA. In addition to the one-year course in sonology that was launched in 1967, there is now also a four-year bachelor’s and a two-year master’s degree programme, the latter being recently rated as ‘excellent’ on all of the criteria by the Accreditation Organisation of the Netherlands and Flanders (NVAO). One of the specialisations in the master’s programme is Instruments & Interfaces, which is offered in association with STEIM in Amsterdam. From 2014, a double degree master’s in Audio Communication & Sonology is also being offered in partnership with the Technische Universität Berlin. In recent years, guest lectures, master classes and workshops have been given by Trevor Wishart, Daniel Teruggi, Nic Collins, Alvin Lucier, Stefan Weinzierl, Gottfried Michael Koenig, Konrad Boehmer, Arne Deforce, Francisco Lopez, Kaija Saariaho, Larry Polansky, Barry Truax, Matthew Ostrowski, Folkmar Hein, Sarah Nicolls, Richard Cavell, Douglas Kahn, Peter Evans, Evan Parker and Horacio Vaggione among many others. The Institute of Sonology adopts a clear stance in terms of the use of technology in music: technology is not merely an adjunct to the existing music practice, but should be used primarily to explore new forms of composition and public presentation of music and art. At the same time, sonology is not bound by any stylistic dogmas. The traditional areas covered in sonology such as studio composition, computer programming, sound research, digital signal processing, algorithmic composition and the theory of electronic music are still strongly represented in the syllabus, but relatively new subjects such as live electronics, improvisation, sound art, field recording and the spatial aspects of sound have become at least as important. 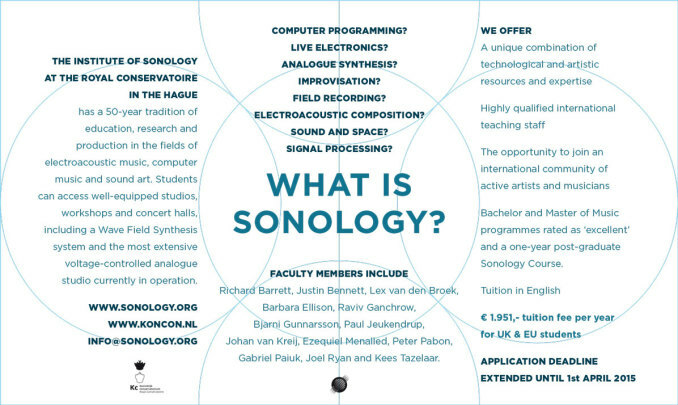 The Institute of Sonology regularly collaborates with the Groupe de Recherches Musicales (GRM) in Paris, the Netherlands Music Institute (NMI), the Studio for Electro Instrumental Music (STEIM), Studio LOOS, the Technische Universität Berlin and The Game of Life Foundation. Students have access to five production studios equipped with high-quality multichannel sound systems. One also contains a Wave Field Synthesis system for spatial sound projection, and another is one of the most extensive voltage-controlled (analogue) studios currently in operation. Every year the students perform the results of the final exams at a small festival in June. Sonology also organises special projects. One example was a three-day festival in the spring of 2012 in which almost all of the electroacoustic music of Xenakis was performed, interspersed with instrumental pieces and accompanied by lectures, workshops and master classes on Xenakis’s music. Another was the Composing Spaces: Spatial Music from Gabrieli to the 21st Century symposium and festival in April 2013, which featured the GRM Acousmonium, the Game of Life’s Wave Field Synthesis system and other sound spatialisation technologies. The Institute of Sonology maintains a close relationship with students who have graduated. A number of them supplement their studies at the institute as research associates, and others continue to present the progress of their research, perhaps as part of a PhD programme elsewhere, on a regular basis. Former students are occasionally invited to give presentations at research seminars or colloquia or to present their work during the concerts. Alumni are active in multimedia art as composers, performers, sound designers, computer programmers and educators, or in various combinations of these professions. Links to former students’ websites can be found at the Alumni page. The Sonology master’s programme serves as an excellent preparation for doctoral research – graduates have continued their studies in PhD programmes at universities such as Stanford University (Björn Erlach, Mauricio Rodriquez), Pompeu Fabra University, Barcelona (Ángel Faraldo), Queen’s University, Belfast (Miguel Negraõ, Henry Vega), University of Washington, Seattle (Stelios Manousakis, Hector Bravo Bernard), University of Music and Performing Arts, Graz (Luc Döbereiner), University of Huddersfield (Barbara Ellison), University of Birmingham (Sergio Luque, Yota Morimoto, Jan Trützschler von Falkenstein), University of Sheffield (Amy Beeston), Leiden University (Juan Parra Cancino, Babis Giannakopoulos), Erasmus University, Rotterdam (Stuart Griffin), University of Salamanca (Ángel Arranz), University of Porto (Filipe Lopes), Brunel University, London (Hugo Morales Murguía), University of Victoria (Jakob Leben) and Oxford University (Patrick Valiquet).